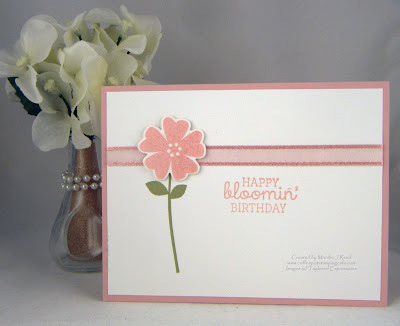 For me, birthdays are always special occasions so my card fits nicely with the "occasion" theme at The Flower Challenge this month. It paired perfectly with the sketch from Freshly Made Sketches. It's for a very dear friend who has a birthday coming up in about a week and a half. The sketch I used is from the Freshly Made Sketches challenge. For all the challenge details, click the image below. 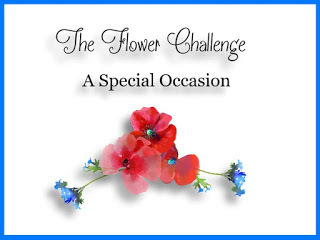 The theme "occasion" is from The Flower Challenge. For all the challenge details, click the image below. Sweet, lovely and oh so delightful! Glad you shad it at FMS! Thanks, Linda. Loved the sketch. What a sweet card! Love that little flower! Thanks for joining us this week at Freshly Made Sketches! Beautiful card Marsha, love the soft colour and the simplicity of the layout. Thanks, Aileen! I don't often use pink but it's perfect for the one who will receive it.